I made it, and a) it wasn’t as bad as I had anticipated; and b) I need a better bra. Wow! I walked briskly for seven minutes, then ran for a minute, repeating three times just as I was instructed. I didn’t trip over my feet, fall down the steps by the courthouse garden, or die from lack of oxygen in the middle of downtown. I made it all the way back to my office safely, and wasn’t too terribly out of breath. As for the bra, I need one that is structurally reinforced with steel rods. The sport bra I have now (no-name brand from Academy) is okay for walking and regular exercise classes with lots of mat work, but it definately is NOT suitable for running with the uber-boobage stacked across my chest. P.S. 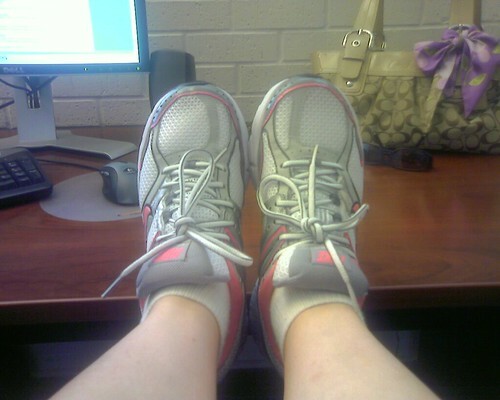 I really like my new running shoes.